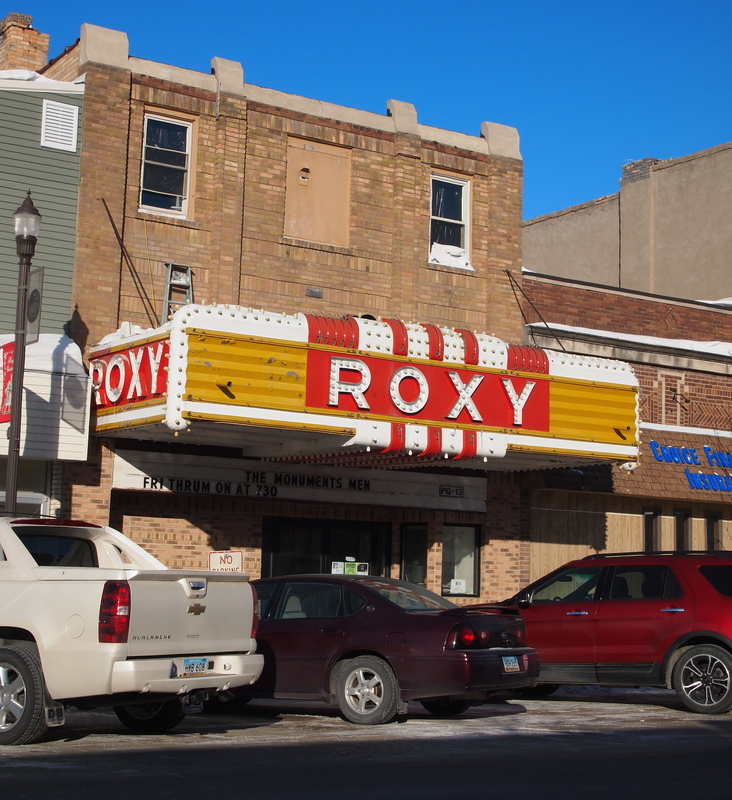 The Roxy Movie Theater in Langdon, North Dakota. Photo from February 2014. Today in the Forum News Service, Ryan Bakken reported on the rehabilitated movie theater in Mayville, North Dakota. It got me thinking a bit about how we are witnessing numerous historic movie theaters get an updated restart in communities across the northern Great Plains (and elsewhere). The movie theater is an important place, allowing a community of movie goers to engage, as we say, in a collective experience. This gives us points of reference in conversation — “Hey, you remember that line from ‘Walter Mitty’?” — and it also allows us to explore and ponder our own humanity. It is different, of course, from live theater, where there is always a direct interaction between actresses/actors and the audience. But the theater idea is the same: bringing together a group of people to take in a performance, or a spectacle. Life is a stage, after all. Beyond Mayville, here are a couple more theaters in smaller North Dakota communities, to add to Bakken’s great write-up of Mayville. The Roxy theater is located in Langdon, North Dakota, just north-northwest of the long-since abandoned Nekoma ICBM missile defense concrete pyramid (it would be good to watch “Dr. Strangelove” at the Roxy some day). I snapped a photo of this Roxy in February 2014. It is up and running, having been brought back to life by the community in and around Langdon. 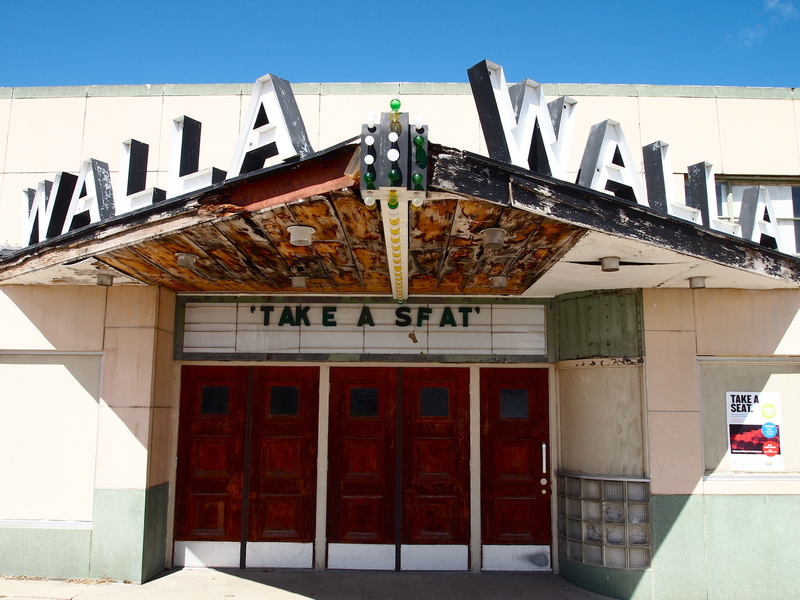 The historic 1949 Walla Walla Theater in Walhalla, North Dakota. It was placed on the National Register of Historic Places in 2010, and the regional arts community is crowd-sourcing funds for its 21st century rehabilitation. And here is the Walla Walla theater in Walhalla, North Dakota. Built shortly after the end of WWII in 1949, this theater was justly placed on the National Register of Historic Places in 2010. The Gorge Arts & Heritage Council (Facebook page here) is in the midst of crowd-sourcing funds to bring this theater back to life. This is a good idea. If you want to take pocket-book action, click on this link here for more information. I was thinking today how much I enjoy these old time movie houses, and how the smaller the town, the more I enjoy them. I like the way that old time movie marquee stretches way out over the pedestrian sidewalk, acting as both a visual lure and a way to bring passersby under its influence. It is a much different feeling than when driving by more modern suburban theaters in our hermetically sealed automobiles. In addition to this, the old time theater is added value to any town, at least so the evening outing option isn’t always a default to the local tavern (not that there’s anything wrong with that, but you know what I mean). Yes, theater regularly plays out in local taverns. But it’s good to have the option to spend an evening in a defined theater proper. 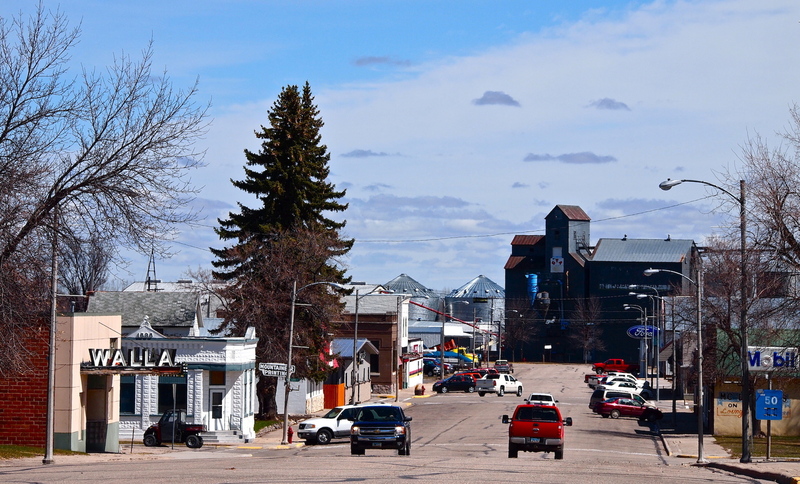 Downtown Walhalla, North Dakota, with the Walla Walla Theater to the left.